How can I change the group colors? You can add another layer of points, ie, see geom_point(…), if you need help with that, let me know. 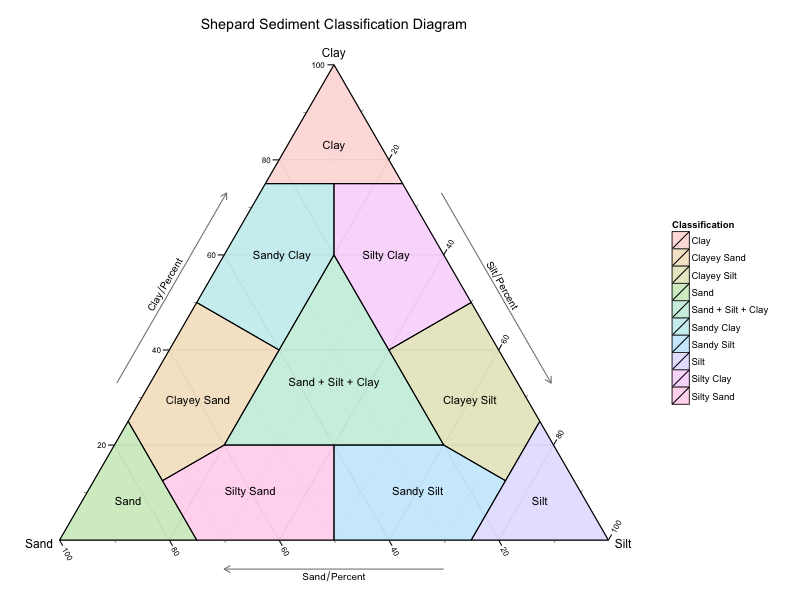 I’have a data set with 3 colums SAND, SILT, CLAY. How can i implement it in your wonderful map ? I have modified the post to cover your question. In summary, this is how you do it. A big thanks for your kind help on this question ! Again many thanks for your website Nicholas Hamilton ! “axis.tern.padding” is not a valid theme element name. Sorry that theme element was removed some time ago, have updated the code, try again. Ah! it worked! The vast corners of the internet have rained down upon me the knowledge of conveniently conveying soil textural classes through the wonders of R. Thank you so much (and to Nicholas Hamilton too for designing ggtern!). Would you mind if I use this colorized textural classification chart in a master’s thesis? Of course not! I would appreciate a citation though. Yes of course! Thank you very much, Nicholas. Hi, Nicholas, will it be possible to plot points with continuous colors (for example, from white to blue) in this USDA chart? Thanks a lot! Yes of course. Same rules for ggplot apply. This chart has a mapping to ‘fill’ already, but colour remains exposed. Thanks a lot. I used colour option, it did work. What is an effective way to label in these ternary diagrams? Thiis is a great ttip particularly to those new to the blogosphere. I have texture data measured on different sites and at different depths. I would like to plot these findings on this USDA chart and would like to have different colours per site and different symbols per depth. But it ends up looking horrible as the colours of the entire chart change. I realize ‘fill’ is already used to build the chart, but is there a workaround? I tried adding two sets of points, one with size=5 that is completely black and another on top with size =4 that has the right colours, but it just ends up looking weird.